Established in 1974, Universal Light Source has become one of the leading sources for UV and Infrared lamps and lighting components in the US. Our customers seek our assistance with new and existing applications for Printing, Aerospace, Biomedical, Printed and Integrated Circuits, Semiconductor, Solar Simulation, Water and Air Purification, Aviation industries and Original Equipment Manufacturers (OEM). 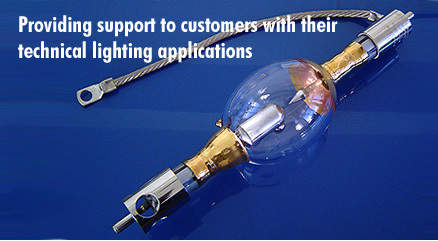 Mercury & Xenon short arc lamps are supplied for aircraft searchlights for Law Enforcement, SAR and Medevac agencies, Theater & Cinema projection, Medical Instrumentation and Solar Simulation to testing UV sensitive materials for glass and window manufacturing. Graphic Arts & Printing companies rely on UV and IR lamps which are used at various points in the printing process to cure and dry inks. ULS lists over 4000 lamps for this industry alone. Exposure units and Optical Systems using UV are used in the Printed Circuit Board industry and for CD & DVD replication where the discs are manufactured, coated with a thin lacquer and screen printed for audio & video, software, instructional and many other applications. UVC Germicidal lamps are used for air and water purification and disinfection. There are over 22,500 wastewater treatment plants in the United States alone with the majority using large banks of UV lamps to kill microorganisms to make the water safe for irrigation and human consumption. Germicidal lamps have an increasing number of applications and our engineers assist in the development by providing critical information along with the lamps, transformers, sockets and detailed diagrams showing how to wire them correctly. Working closely with our factories we can produce virtually every lamp type for all applications and industries. With a complete understanding of the chemistry, physics and mathematics used for these processes we have the ability to modify lamps to shift the spectral output for proper curing of new or different inks or substrates.